“Mayor Bowser cut the ribbon on the new Klingle Valley Trail and celebrated by leading the trail’s inaugural community walk/ride. The event showcased the new trail that stretches from Woodley Park through Cleveland Park and Mount Pleasant and connects to Rock Creek Park. The Mayor was joined by Ward 3 Councilmember Mary Cheh, District Department of Transportation (DDOT) Director Leif Dormsjo, the Klingle Valley Trail project team, Washington Area Bicyclist Association representatives, and community members. 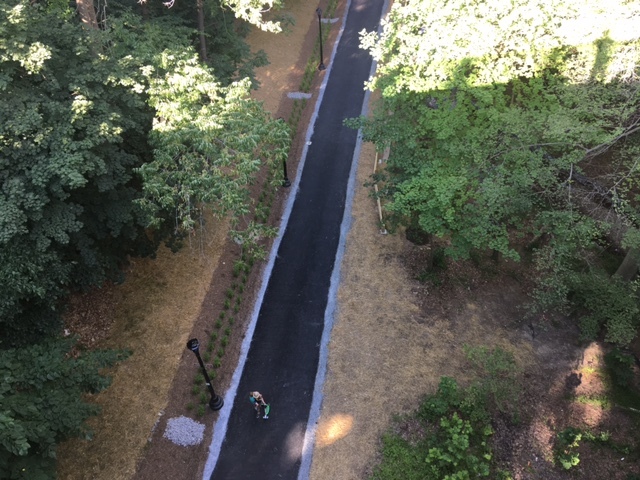 The new 0.7-mile paved trail was constructed with repurposed material from the formally washed out Klingle Road and marks the first time the city has converted a road into a trail just for bicyclists and pedestrians. The project was a collaborative effort that involved DDOT, the National Park Service, the Federal Highway Administration (FHWA), DC Water, Washington Gas, WMATA, the DC Office of Historic Preservation, and the Tregaron Conservancy. The $6 million project involved removing existing road infrastructure, restoring the Klingle Run stream flow, introducing new trees and landscaping, building new retaining walls from reclaimed stone, and installing permeable trail pavement, new drainage and storm water structures, fencing, lighting, benches, and signage. Additionally, a new sidewalk was added along Klingle Road to Porter Street, NW. Since taking office in 2015, Mayor Bowser has prioritized the development of accessible and safe multi-modal transit routes. Most recently, the District opened the Kenilworth section of the Anacostia Trail in the fall of 2016, adding to the more than 40 miles of trails in the Anacostia watershed. Currently, DC has more than 145 miles of bike lanes and trails throughout the city. The ribbon cutting is part of Back to Basics DC, an effort to highlight the day-to-day work that keeps the District moving forward. Follow Back to Basics DC on social media using #backtobasicsDC.